World Cup 2018 Saint Petersburg is one of the hosting cities for the biggest event in soccer—the Fifa World Cup. See more information here. Saint Petersburg  (Russian: Санкт-Петерб́ург Sankt-Peterburg;) is a world-class destination and Russia's second largest city, with a population of more than 5 million perched at the eastern tip of of the Baltic Sea and the Neva River. The city was formerly known as Petrograd (Петрогр́ад), and later Leningrad (Ленингр́ад). This is one of the most breathtakingly beautiful places on earth and virtually any building in the large historic centre, threaded with canals dotted with baroque bridges, can be considered an attraction—and indeed, it is a UNESCO World Heritage site. This is a magical city, with a long list of major attractions. Its Hermitage Museum, housed in the Winter Palace of the Romanov Dynasty, is both one of the world's greatest and oldest collections of art, treasure, and antiquities, and one of its most beautiful buildings. Founded by Peter the Great in 1703, in the territory of the Inkeri town of Nien which was a capital of Finno-Ugric province Ingermanland which was part of Novgorod Republic, and Sweden. The first settlements in this region date from 2500 years ago. Archaeologists found old graves full of izhora silver treasures, also korela-inkeri epos of Kalevala halfly was written near Sester river, modern Sestroretsk. In this time the lifestyle of aborigines was very different it was forest people which lived in tunnels underground, famous for hunting, mushroom medicine, and making steel. It was place of joining three finno ugric subethnosos suomi Inkeri and Karela, St Petersburg the former home of the tsars and the centre of imperial Russian culture, Saint Petersburg was known as "The Venice of the North" in its heyday. Re-christened Petrograd during the first World War, the city was renamed Leningrad in 1924 in honour of communist revolutionary and founder of the Soviet Union, Vladmir I. Lenin. Bombed, besieged and starved during World War II, the city took a back seat to Moscow during the Soviet-era. Since the collapse of the Soviet Union, the city has rapidly been making up for lost time and is by far the most cosmopolitan and Western of Russia's cities. Renamed once more in the aftermath of the fall of the Soviet Union, most Russians know it as Piter (Питер), a familiar diminutive of Saint Petersburg. During the hardship years of Yeltsin's presidency, much of the city was controlled by the infamous Tambov gang, but have since reduced in influence. With world-class architecture, astonishing views and friendly people, there's lots to do here. There is a huge seasonal variation in day length due to the city's position at 60°N. Days are less than 6 hours long at the end of December, but it never gets darker than twilight during the White Nights season in June. Not only are the days very short in late autumn and early winter, but the weather may be overcast for weeks, without a hint of blue sky, which may feel depressing. The driest season with least precipitation is early spring. July and August are usually the rainiest months, though the difference is usually not big enough to worry about. But if you care about this, it is a good idea to have an umbrella or raincoat handy. In November–March there are hardly any tourists at all, so you won't see the long lines of the summer at the Hermitage. Saint Petersburg's neoclassical streets are also simply gorgeous in the snow. Temperatures can range from slightly above freezing point to bitterly cold. From time to time it may get to -25°C (-13F) and below, often with high humidity and wind, so be prepared to dress warmly. Most major tourist attractions, except those relying on the water, are still open and some hotels offer lower prices during this time. The ground is usually covered in snow and the rivers and canals are frozen during this time. Snow is not always removed from streets in time and may exacerbate traffic problems. There is danger of slipping on ice or getting hit by falling icicles. Wear good boots, take small steps, and watch your feet! In April, the streets are covered in sludge as the snow melts. June is peak tourist season during the famous White Nights (roughly 11 June–2 July), when the sun sets only for a brief period of twilight, and the streets stay alive around the clock. Book early. July and August are usually the warmest months. This is a rather northern city, and it rarely gets really hot, but even more modest warmth can be hard to bear in summer because of the high humidity. Rain showers usually come and go throughout this time, so it is always a good idea for one to have an umbrella or rain jacket at all times, even on sunny clear days. Late September—early October is a lovely time in the city. The temperatures drop to moderate, often with strong winds, and the tourists are all gone. Rain is still common. Fountains operate from May through mid-September. Most trees are in leaf from May through October. Note the days of school holidays, when museums and other similar venues can become considerably more crowded. School holidays are in early November (autumn break), the first half of January (winter break) and late March (spring break). Moreover, general holidays are held around the New Year into early January, as well as in early May. Russian visa requirements are complex but are not hard to manage with some online research. See the Get In section of the article on Russia for information. A visa is not required for a trip of less than 72 hours if you arrive in St. Petersburg by ferry or by cruise liner and you have a pre-arranged program of excursions by an approved local company. This kind of visa for cruise passengers is called Blanket visa and can be ordered online at Russian travel agency. Pulkovo Airport (IATA: LED), 20km south of the city centre, serves many international and domestic destinations. A new terminal opened in 2014. There is unlimited free Wi-Fi. The airport has business lounges that are free for first and business class travelers but are available for use by all passengers upon payment of a fee. The lounges include snacks, drinks, televisions, and showers. City buses numbers 39, 39Ex and minibus K39 operate service between the airport and the Moskovskaya (Московская) metro station (RUB40, 35 minutes). Buses are available 05:30-01:30. From the Moskovskaya metro station, you can take metro line 2 (blue), which operates between 5:45AM and 12:20AM, to the city centre (20 minutes). If you arrive late at night and the metro is not operating, you can also take a night bus from the metro station to the city centre. Minibus K39 also stops at the Aeroport commuter rail station. From there, you can take a train to Saint Petersburg's Baltiysky Station (17 minutes, 6:00AM-11:30PM), next to the Baltiyskaya metro station. This is only convenient if it is near your accommodation. Uber costs RUB500-900 to the city center. Taxis can be ordered from the service booth in the arrivals hall. Prices are fixed based on the zone of travel; the cost to the city centre is RUB1000-1400, including booking fees. Do NOT accept an offer of a taxi ride from one of the 'helpful' guys who wait around the arrivals lounge claiming to be official drivers - these are scammers who use meters charging RUB900 per kilometre, resulting in a charge of approximately RUB7500 for a trip into the city centre. Without traffic, the trip takes 30 minutes, but it can easily take an hour during rush hour. As an alternative, Taxi 068 has a mobile app that you can use to book a taxi to the center for RUB600, but you will need a Russian phone number to communicate. If calling from the airport arrival hall, it will take 10-20 minutes for the taxi to arrive. Pre-booked taxis will cost RUB1,300-1,600 to the centre, but you will be welcomed in the arrival hall by your driver carrying a sign with your name. Pre-booking through the internet is without risk, no credit card information is asked, and pre-payment is not required. aFrendy, Kiwitaxi and LingoTaxi have English-speaking drivers and dispatchers. Baltiysky Station (Балтийский вокзал) (Metro: Baltiyskaya) - Trains operate to/from Petrodvorets (Peterhof), Lomonosov (Oranienbaum), Gatchina, Luga, and other cities. Also used by trains to/from Aeroport station, with connecting buses to Pulkovo airport. Finlyandsky Station (Финляндский вокзал) (Metro: Ploschad Lenina) - Trains operate to/from Vyborg, with continuing service to Helsinki (Allegro high speed) and other cities in Finland. Ladozhsky Station (Ладожский вокзал) (Metro: Ladozhskaya) - Trains operate to/from Murmansk, Ekaterinburg, Cheliabinsk, Omsk, Novosibirsk, Astana (Kazakhstan), Helsinki (night-train Leo Tolstoi), and other cities. Moskovsky Station (Московский вокзал) (Metro: Ploshchad Vosstaniya & Mayakovskaya) - Trains operate to/from Moscow, Novgorod, Ukraine, Azerbaijan, Volgograd, Kazan, Samara, Rostov-on-Don, Ufa, Sochi,Tallinn(Estonia) and other cities. Vitebsky Station (Витебский вокзал) (Metro: Pushkinskaya) - Trains operate to/from Pushkin (formerly Tsarskoe Selo), Pavlovsk, Belarus, Czech Republic, Hungary, Poland, Ukraine, Romania, Moldova, Bulgaria, Germany, Lithuania, Riga (16 hours, from RUB2,700). Tickets for travel originating in Russia can be bought at the train stations or online. Long distance train tickets are generally more expensive if bought close to the date of travel. See Russia#By train 2 for more details on travelling in Russia by train. Sapsan high-speed trains (4-5 hours, 6 per day, RUB2,300-3,500 for 2nd class if bought several days in advance) make travel between downtown Saint Petersburg and downtown Moscow very easy. Some trains make a few stops including Tver. The crew speaks English. Overnight rapid trains (8-9 hours, RUB800+) are slower but usually cheaper. Price and comfort levels vary, with the luxurious private Grand-Express "hotel train" (featuring some compartments with showers!) at the high end, all the way down to budget connections in third-class platzkart cars. Second-class coupe coaches, which include a bed and sheets, are a good value. VR Group operates high-speed Allegro trains running at up to 220km/h between Helsinki and Saint Petersburg (3.5 hours, 4 per day, €29-79 for 2nd class). Tickets originating in Finland can be purchased from the VR Group website, via some travel agencies, and at major VR train stations in Finland. Border-crossing formalities are completed on board the train immediately after departure from Helsinki. The trains are almost always on time and there are no delays in crossing the border. On-board currency exchange is available. International buses and buses to major cities in Russia all leave from the main bus station (Avtovokzal), near the Obvodny Kanal metro station. Some may make additional stops elsewhere in the city; see below. Buses are the preferred method of travel to/from Estonia and Latvia, but generally do not make sense for travel to Finland or within Russia. The process of crossing the border by bus takes much longer than when travelling by train or air. Border agents only speak Russian and are sometimes not aware of visa requirements, which leads to delays. The train is much more preferred method of travel than the bus within Russia, due to permanent traffic jams in both cities. Domestic bus schedules can be accessed on AviaBus. Lux Express operates service to/from Helsinki (€15-20, 7 hours, 3x per day). This is the cheapest way to travel to Helsinki, although it takes twice as long as the train. Lakeland Line service by a Finnish company between Saint Petersburg and Vuokatti prices ranging from €20-24 for Lappeenranta, and €60-68 for Vuokatti. Stops at several cities including Kuopio and Savonlinna. Matkahuolto provides information on traveling by bus to/from Finland. There are direct buses between Saint Petersburg and Helsinki (7-8 hours, 4 per day, €35) and Lappeenranta (6 hours, 3 per day, €31), with further connections to other cities in Finland. Sovavto operates daily buses between Saint Petersburg and Turku (10 hours, €53), with stops at several cities including Helsinki (7.5 hours, €35). Note that the timetable on their website is misleading and the buses leave from the bus station earlier than the time stated on the website. The correct time and stop listing can be seen from ticket once it has been purchased. Lux Express operates service to/from Tallinn (€14-30, 7 hours, 7x per day) with a stop in Narva (€9-16, 5 hours, 7x per day), Tartu (€22-25, 7 hours, 5x per day), as well as a service to/from Riga (4x per day, 11 hours, €33-35), with continuing service to the rest of Europe. Office at Mitrofanjevskoe Shosse 2-1, near Metro Baltiyskaia (Baltiyskiy vokzal). Tel: +7 812 441 37 57. Lux Express buses depart from Baltiskii Station and the main bus station (Avtovokzal). Ecolines operates daily departures to Riga (€36, 10-12 hours, 3x per day) as well as service to Minsk (€34, 15 hours, 1-2x per day) and Kiev (€68, 19 hours, 2x per day). Office at Pod'ezdniy pereulok 3 near Metro Pushkinskaya 10:00-22:00. Tel: +7 812 314 2550, +7 901 300 6170. Ecolines buses depart from Vitebsky vokzal (near Metro Pushkinskaya) and the main bus station (Avtovokzal). If you join a cruise tour of St. Petersburg, then you don't need a Russian visa but you have to stay with the tour. See Russia#Visa free entry by ship. St. Peter Line operates visa-free cruises to St. Petersburg from Helsinki, Tallinn, and Stockholm. RechFlot and Stolichnaya Sudokhodnaya Kompania (SSK) operate river cruises on the inland waterway "Volga-Baltic" which links Moscow, the River Volga, and Lakes Onega, Ladoga and Neva. Passenger Port of St. Petersburg “Marine Façade" is the main boat terminal in St. Petersburg, and is where 90% of cruise ships dock. It was built on reclaimed land on the western shore of Vasilyevsky Island at the mouth of the Neva River, 8km west of the city center. With its 7 berths and 4 terminals, Marine Façade is able to handle 7 large cruise ships and more than 15,000 passengers per day. Bus #158 operates between terminal 3 and the Primorskaya (Примо́рская) metro station. Smaller cruise ships sail up the Neva river and dock at either English Embankment (Англи́йская на́бережная; Angliyskaya Naberezhnaya) or Lieutenant Schmidt Embankment, both of which are closer to the city center. Except during the winter, the 9 low bridges in St. Petersburg are drawn during the night to allow for the passage of boat traffic. Therefore, if you don't make it to the side of the river where you are staying before the bridges are drawn and there are no high bridges to cross, you will be stuck until the bridges are lowered. Note that there are "breaks" when some of the bridges are lowered in the middle of the night for approximately 30 minutes to briefly allow everyone to get home. The bridge schedule is particularly noteworthy for those staying on Vasilyevsky Island, which is unreachable at certain times of the night. Seeing the bridges drawn in the middle of the night is a must for all visitors to the city! The Bolshoy Obukhovskiy Most, 14km south of the Alexander Nevsky Bridge (Most Aleksandra Nevskogo), is never drawn, allowing for 24-hour crossing of the Neva River. However, the bridge is out of the way and will increase the cost of your taxi or Uber. The official bridge draw schedule is published online. Saint Petersburg's metro system is the second largest in Russia, after that of Moscow. The metro is a cheap and effective way to get around the city, and also a major tourist attraction due to the beautiful decorations of the stations. Amateur photography (without a tripod, etc) is allowed, although professional photography is prohibited. The trains are fast and run frequently. During rush hour, there are often only 30 seconds between trains. Fares are RUB45 per entry regardless of the distance traveled. Multi-trip passes can be purchased including a 10-trip pass for RUB355 (must be used within 7 days of purchase). The system can be accessed by inserting a brass token into the turnstile slot, by tapping a Podorozhnik smart card purchased from a machine at the station, or by tapping a Mastercard PayPass or Visa PayWave card on the white circle near the turnstile. Large baggage requires payment of 1 additional fare. Opening and closing times vary; the subway is closed from approximately midnight to approximately 05:45, depending on the station. Metro maps can be found in every train car and always have station names in the Latin alphabet. The station names on the platforms are also in the Latin alphabet, and many other signs are in English. Station announcements on the train are only in Russian, but if you listen carefully you will hear the conductor announce the current station name and the next station as the doors are closing. Stations are deep underground, and transferring trains at transfer stations involves long walks that can take up to 10 minutes. Trains can be extremely crowded during rush hour. Be aware of your belongings and expect to have to push your way out of the train upon arrival at your station. Buses (автобус - avtobus) and trolleybuses (троллейбус - trollejbus) run frequently and cover much of the city. Route information is available using Google Maps. Information for trolleybuses and trams is also available online. Trolleybuses are indicated by the letter 'm' (the lower case version of the Russian letter 'т') on the stops, and diesel/gas buses by the letter 'A'. Both buses and trolleybuses may show the same route number, but the trolleybus route in this case is frequently shorter, and can vary in some minor respects. Trams (трамвай – "tramvai") are not common in the city center due to traffic issues but are available outside the city center. Tickets (RUB40, more to the suburbs) are sold by attendants on board the vehicle. They usually only speak Russian and prefer exact change. Buses and trolleys on main routes are frequently overcrowded. If you are caught without a valid ticket, you will be fined RUB300. Taxis are always available but are much more expensive at night. Every private vehicle is a potential taxi. Flagging down a vehicle and paying for a ride somewhere is perfectly normal in Russia and quite popular although ill-advised for tourists. Safety is, of course, an issue. As a rule, you should never get in a private cab if it already has passengers inside. Refuse requests from the driver to take on more fares unless you reached your destination; if he insists, ask to stop at a safe-looking place, pay and leave. If the driver stops for gas, step out of the car, take your belongings, and get some fresh air while he is fuelling it. Those travelling alone (men and women) should wave off any suspicious ride for any reason whatsoever. Gypsy cabs which linger near popular bars and restaurants at night have been known to be especially dangerous, with several instances of druggings and robberies. Drivers do not usually speak English. Watch out for overpriced taxis outside Hermitage museum. They have meters that run at 4 times the rate of regular taxis. Negotiate a flat fare before getting on the taxi. If the driver insists on using the meter you should walk away. Uber is a safer and cheaper method of transport than taxis. Drivers usually don't speak English, but communicating with the driver is not necessary since the fares and destinations are all handled through the app. Popular alternatives to Uber are: Yandex.Taxi, Gett and Taxovichkoff (all have mobile apps and have similar concept to Uber). Route taxi (маршрутка - marshrutka) is sometimes the fastest way to get somewhere. Vans have 14-20 seats, are usually white or yellow, always with a letter K followed by the route number plate (such as K-28). Often they are small Chinese or Turkish buses. There are no regular stops; you must tell the driver when you want to get out, or wave while on the roadside to stop one. You must pay to the driver at entry, usually RUB30-40. If you cannot reach the driver on your own, pass the money through the other passengers and be ready to pass other's money if you sit close to the driver. The Marshrutka experience may seem exciting sometimes, especially when you see some brave driver counting change while steering with his knees at 110km/h (70mph). Many marshrutka drivers are illegal immigrants and speak Russian poorly (if any at all). Commuter trains (электричка, elektrichka) may be useful to get to the suburbs. Fares are based on travel distance. Speeds are moderate, but trains operate frequently. Information is available in Russian online. While the terrain in Saint Petersburg is flat, the city is not bicycle-friendly due to limited bike lanes, bad weather, and dangerous car traffic. However, you are allowed to take a bicycle onto the elektrichka trains upon payment of a small fee and go to a less crowded suburb to enjoy a ride. The historic center of Saint Petersburg and Related Groups of Monuments are UNESCO world heritage , so definitely worth your while. The Hermitage Museum complex from across the Neva River. From left to right: Hermitage Theatre – Old Hermitage – Small Hermitage – Winter Palace (the "New Hermitage" is situated behind the Old Hermitage). The Hermitage Museum/The Winter Palace  is Saint Petersburg's prime attraction, a massive palace-museum showing the highlights of a collection of over 3,000,000 pieces spanning the globe. The Hermitage is truly one of the world's great museums, with an imposing setting displaying priceless works by Rembrandt, Leonardo, Michelangelo, Rubens and more. Getting a tour guide is recommended; they can charge as much as $100, but the additional information they impart can be well worth the price, and they can readily take you directly to the items you want to see. Ticketing is complex, but the Hermitage itself is RUB400 for Russians and RUB700 for foreigners (April 2018) and they do check if you have a Russian passport, even if you speak Russian. Students of all nationalities get in for free, but don't forget your student card with photo (the 'administration' will likely reject your ID if it doesn't have a date on it). Entrance is free on the first Thursday of every month. Large bags aren't allowed in the museum, and a massive cloakroom downstairs (no charge, as usual in Russia) exists to assist with jackets and bags. A ticket allowing photography costs RUB200. Some rooms and all temporary exhibits prohibit all kinds of photography. Advice for foreigners visiting the Hermitage Museum: Find a tour group. This may have changed, call the museum ahead of time to find out. : Entry fee is RUB200 instead of RUB400, and includes the photography fee and a whistle-stop tour of the museum (but note the free entry for students). Don't accept a tour from the numerous touts hanging around the queue. Instead, march past the queue and in through the main entrance, or the exit opposite if the queue's blocking the entrance (don't worry, you're not queue-jumping). Have a scout around for notices with museum tour times in your native language, or in extreme circumstances, ask at the desk. If you find a good candidate, you're all set to go to the Tours Office to book yourself on it. This is where things get slightly surreal. To get to the Tours Office from the main entrance, go forward past the cashiers, and turn left down the corridor. The Tours Office is in front of you at the end, and may or may not be marked. Get yourself a place on your tour, collect the bit of paper, go to cashier No. 5 (who is not with the rest of them, instead turn left out of the Tours Office and she's in a box at the end of the corridor), pay, get your paper stamped, take it back to the Tours Office and get it checked, stamped again and muttered over and then you're ready to brave the coat dungeon. You can buy tickets on-line, and have a confirmation emailed to you. It is currently slightly more expensive than a local ticket as they charge in dollars at an old exchange rate ($18 including photos), you just walk straight to the front of the queue. Hand your booking confirmation and passport to information desk. She will get the ticket office to check your details and issue the tickets. The queues at the ticket office can be long, and purchasing a ticket online can help you bypass this queue first thing in the morning. However, at other times the museum can limit the admission rate because of the numbers already in the museum. In this case having purchased your tickets in advance won't save you as much time. There are also ticket machines just before you get to the cash desk which have much shorter lines. The museum has a cafe and large shop near the entrance, and numerous small shops throughout the galleries. Audio guides are available in English, and most signs in the gallery are in English and Russian. Guide books are available for around RUB300. The bridges on the Neva . Open 2 times per night to allow boats to pass. Museum of Artillery, Combat Engineers and Signal Troops . Housed in old Arsenal fortress-like building near the Peter and Paul Fortress and surrounded by moat. HUGE collection of weapons from the beginning of history until the present, including an extensive collection of Soviet weaponry from WW2 and the Cold War. Tanks, ballistic missiles, Katuscha trucks, countless Kalashnikovs. Personal note: Absolutely awesome, one of the highlights of all my European travels. If you speak Russian and can pass as a Russian, a 2-hour private guided tour costs around €15. Closed Mondays, Tuesdays and the last Thursday of the month. Alexander Nevskiy Monastery. Located at the Eastern end of Nevskiy Prospekt next to the River Neva. The site also has the Tikhvin Cemetery which houses the tombs of some of the world's most famous composers; Tschaikovsky, Rimsky-Korsakov, Mussorgsky and Borodin, and also the author Fyodor Dostoevsky, along with many other famous Russian figures. Peter the Great's Cabin. Peter the Great's men built the small wooden cabin in a matter of days for him when he planned the city and it has been preserved in a small brick building in the district Petrogradskaya. It is located close to the Cruiser Aurora on Petrovskaya Naberzhnaya. If you have seen the top tourist destinations but still have enough time, turn off the tourist highway and see some more churches and temples scattered throughout St. Petersburg. Many of them do have something unique to show! No trip to St. Petersburg is complete without seeing an opera or ballet performance. The Mariinsky is perhaps the most well-known institution, but it is by no means the only theater in the city. Tickets are sold throughout the city at kiosks and shops called Teatralnaya Kassa, which charge a nominal (usually about 20 RR) fee for "insurance," which is theoretically optional. The theater box offices themselves sell tickets directly, too, and usually for the same price. Sometimes blocks of tickets sell out at the kiosks but tickets are still available at the theater, or vice versa, so it is worth checking both places if you have your heart set on a particular performance. It is possible to take not-so-small children into some performances if you take a private box, although you will need to ask when you buy your tickets. You are now able to purchase online tickets for the same price as you would be able to buy them directly at the theatre. However, make sure that you use the official site of the theatre in question rather than third-party sites, as these often add a hefty commission for no good reason. The music scene in St. Petersburg is diverse, with several classical, jazz, and pop concerts to choose from each week. Tickets are available at the same Teatralnaya Kassa locations as ballet and opera tickets, although tickets to pop concerts - especially US and European stars on tour - sometimes use exclusive distributors. For pop and rock concerts, unless you buy tickets for the dance floor (tanzpol), you are expected to sit quietly in your seat as if you were at a ballet - ushers are vigilant about keeping the audience from standing up, dancing, or cheering (polite applause is allowed, but that's about all). Several of the ballet and opera theaters above also offer orchestral and recital performances, so those are not repeated below. Also, don't forget the many small clubs where up and coming bands play. Most cinemas in St. Petersburg show Hollywood films dubbed in Russian. Art cinemas like Dom Kino often show independent American or British movies subtitled in Russian. DVDs of American/European films are also often dubbed. There have been crackdowns on sellers of bootleg DVDs, so it may be difficult or expensive to find DVDs in English these days. There are several DVD stores in the city - often near Metro stations - and it is worth asking about films in English. Annual Message to Man  international documentary, short, and animated films festival takes place in June or July, screening many films in English. St Petersburg is considered to be a cultural capital of Russia not only because of Hermitage, but also because it attracts people working in creative industries. There many young artists, musicians, designers etc. These kind of people have their own places, so called "creative spaces" (креативные пространства in Russian). It's interesting to see young designers and programmers working or tourists sleeping in ex-palaces on the river bank. St Petersburg is beautiful city. But there is no observation platform like in Paris or London. Because of the constructions law that forbids building skyscrapers in historical centre. So there are few options where you can get great view. A tour of the canals by boat is a great way to see the city in the summer. The typical tour is through the Moika, out to the Neva to see the Peter and Paul Fortress and the Cruiser Aurora, then in through the Fontanka (sometimes as far as the Mariinsky Theater). Tours start at many points along the route and return to their starting point - hawkers for different boat companies abound - and the boats may or may not have a cafe and toilet on board. Almost all tours are in Russian. RUB400-600 seems to be the average price. You can also walk along the canals and admire the numerous bridges, some of them very interesting (like the Bank Bridge). The alternative way to explore St Petersburg is to know it from inside, walking and talking with locals and trying local activities. Those people who have lived here for years would like to tell you a plenty of stories, open some secret places (as roofs or courtyards etc.) and treat you as a friend. Victory Day (День победы), on May 9, celebrates the Soviet victory over Nazi Germany in 1945. This day is marked with an opening military parade on Palace Square, directly in front of the Hermitage, visiting various war monuments, giving flowers to war veterans who are dressed in full military outfits, and an evening parade down Nevsky Prospekt which includes survivors of the Siege of Leningrad. Scarlet Sails takes place on the weekend of the summer solstice, the longest day of the year, around June 24. It includes concerts, water shows, and fireworks, with festivities going until 4:00AM. The main streets are closed for the festivities. City Day 27th of May. Stars of the White Nights Festival includes performing arts events in June, centered around the Marinsky Theatre. New Years is the biggest holiday of the year in Russia. There are plenty of ATMs and legitimate currency exchange booths in the city centre. There are also many 24-hour supermarkets. Souvenirs are commonly available on Nevsky Prospekt, particularly near the Hermitage, although prices for everything are higher here than on side streets. Raketa wristwatches (Часы Ракета) for over half a century tourists have been hunting for Russian watches in Saint Ptersburg. But be aware of many counterfeits. The most wanted Russian watches in Saint Petersburg are the one produced locally by the "Petrodvorets Watch Factory - Raketa" Russian's 300 years watch factory (By the way the Factory, located in Peterhof, is open to visits. Founded by Peter the Great in 1721, this Manufacture is the last one in Russia, and one of the very few in the world to produce its mechanisms from A to Z. Since counterfeits are mostly found, we advise you buy only those Russian watches in the shops listed on the factory,s site. Russian cuisine is famous in the world, and high-quality authentic Russian dishes are available all over Saint Petersburg. But there is other interesting food in the city. 2) Georgian food. Very unique and tasty cuisine. Georgian restaurants are scattered all over St Petersburg. It's more expensive (600RUB/meal) than Uzbek. But worth trying. 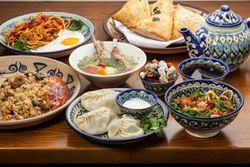 It's hard to find Uzbek/Georgian food outside of ex-USSR. Try it here. Nothing, absolutely nothing, tastes better than hot Russian crepes with caviar, mushrooms, caramel, berries, or what have you with a cup of tea on a cold winter street. Grand Hotel Europe Restaurant. The Sunday Jazz Brunch here is a "Not to Miss" if you are looking for a real splurge. About $90 USD per person includes a full caviar spread and sushi bar in addition to the normal brunch fare (carving station, omelette station, salads, fruit, baked goods, desserts, the options are nearly endless). There is also bottomless champagne glasses (and the champagne is quite good) and a huge frozen ice sculpture that is tapped where you can refill your glass with iced vodka as many times as you'd like. The jazz is very good and the pace is relaxed and enjoyable. The only caveat: As with most Russian eateries, there is no non-smoking section, so if you are not a smoker, ask for table away from the majority or risk having to inhale cigarette smoke while you dine. Bars in Saint Petersburg generally have the best beer selection of any city in Russia. The Baltika Brewery headquarters is in Saint Petersburg and the beer is very popular in the city. Many tour companies offer nightly "pub Crawl" tours of Saint Petersburg; these can be found easily via an online search. Dumskaya ulitsa has several small crowded and rowdy venues including Datscha, BarBarA, Fidel, Belgrad. These bars have cheap beer, crazy dances, Balkan, ska, punk, disco or whatever the DJ has on his mind. There is a wide and excellent selection of great clubs that will satisfy all tourists looking to spend the night out. The city hosts clubs of all music. Rock, pop, jazz, hip hop/RnB, and a lot more. Due to social stigma, there are not many gay clubs in Saint Petersburg. However, there is a large underground scene and many people use online websites and mobile applications to meet other gay and lesbian folk. With the exception of some high-end hotels, all hotels and hostels offer free WiFi and many have computer terminals. Almost all accept credit cards. For information on using telephones and buying SIM cards in Russia, see Russia#Contact. The emergency service number is 112. Free WiFi is available in most hotels, cafes, restaurants, bars, and shopping centers, but free hotspots require registration using a Russian cell phone number. Another variant in catering establishments is WPA2 protected WiFi: you will be given the password after making an order. There are many computer clubs/internet cafes, usually crowded by kids playing CounterStrike. Saint Petersburg has a somewhat undeserved reputation for being a dangerous city. Things have calmed down since the Wild West (or Wild East) days immediately after the collapse of the Soviet Union, but some common sense is still required. As with most other major cities, avoid traveling alone at night, and do not get into altercations with drunks. If traveling at night, it is recommended to stay on the main sidewalks and avoid any dark alleys or yards. Gypsy cabs are not recommended under any circumstances, especially those that linger near bars where expatriates and tourists congregate. Downtown and western parts of the city are safest. Suburbs like Kupchino, Veteranov, Ligovo and Sennaya in the centre should be avoided at night time. As a general rule, the farther you are from the city center, the more dangerous it is. Saint Petersburg's football club, Zenit Saint Petersburg, is one of the biggest clubs in the country, and has its own gang of hooligans. If you decide to visit the football stadium to watch the club play, you should buy tickets to center sectors. If you do not do this and a fight starts, you are likely to get dragged into it by either the hooligans or the police, since both will think you are part of the brawl. Take care of money, documents, cameras, mobile phones, and anything of value because of pickpocketing. Especially watch out on the Metro during busy times, as people start pushing at the train doors, and pickpockets are frequent, particularly (but not only) at Gostinyy Dvor Metro Station. When riding the Metro, keep in mind that robbery can be a real threat; you should constantly watch what is going on around you and who is standing very close to you. Thefts of photo equipment are really a big problem in Saint Petersburg. Photo bags probably won't save your camera -- it can be opened in less than 5 seconds. Cameras should be kept in bags slung across the body at all times, with your hands keeping a firm grip on them, and no watches or jewelry should be visible at all. Quite obviously, do not show in public that you have a lot of money. Robberies are not uncommon, and many foreigners have been threatened at gun and knife point. However, foreigners are not targeted specifically, and robbers will attack both foreigners and natives that carelessly reveal their wealth. 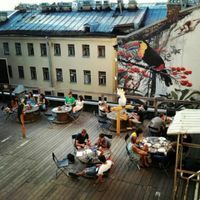 Take special care on Nevsky Prospekt, particularly the area with the city tour buses, a favorite spot of pickpockets and particularly of those after photo equipment. On the bright side, "Nevsky Prospekt" sees little mugging. Russian driving is wild. Drivers attack their art with an equal mix of aggressiveness and incompetence. Guidelines are lax and rarely followed. As a pedestrian, take great care when crossing the roads, as pedestrian crossings are in 99% of cases ignored (even by police). If you are thinking of driving yourself, bear in mind that the Russian traffic police are extremely corrupt, even by Russian standards. Pedestrian crossings with a traffic light are quite safe to use, most car drivers will stop (of course, other cars will either be rear ended, or drive through crossings at ridiculous speeds with no regards for safety). Just like in any other big city always look left and right before crossing the road and make eye contact with the driver if possible. Bar fights do occur. In the centre of the city and around Nevsky Prospekt, they are unlikely to happen. However, in the suburbs and local cheaper pubs, fights occur almost daily. If you are staying with locals living in these areas, it might be a good idea to avoid these bars. Police are unlikely to show up as they consider fights as small, unimportant, regular and a waste of time, and they will probably laugh at you for calling. Another subtle danger that can affect your trip is the inevitable effect of winter weather. Poor clearance of snow and ice is a big problem in this city. Caution is advised in snowy winters because of falling ice from roofs, and pedestrians should pay special attention to ice on the streets. Overall, be warned that if you are used to living in the US and/or Western Europe, Saint Petersburg, as well as the rest of Eastern Europe, will seem different, and, at times, a bit intimidating. On the other hand, Russian people are usually friendly, welcoming and interested towards foreigners, and nothing should happen to you unless you put yourself in harm's way. If you don't care about them they don't care about you, and nothing should get in your way of having a great holiday. Girls approach you and invite to have drinks together, and the even offer to pay for those drinks. They build trust and take you to other bars. After those bars they talk to a friend on the phone that says that whatever club you want to go is closed and so they take you to Crystal club. There you immediately start being served drinks and food without showing you the menu and then they charge you a ridiculous amount. Calling the police is pointless as they will not show up. The private hospitals listed below have English-speaking Russian doctors (very few, if any, hospital staff are expats). Depending on the type of service provided and the terms of one's insurance policy, these hospitals may be able to arrange direct billing with European and American medical insurance companies. The city's water system is not ideal because of a number of old pipes and as a result does not provide 100% clean water. Some locals boil or also filter tap water before use; you might want to buy it bottled if water quality affects you. In Saint Petersburg cold water is cleaner than hot. There are numerous public toilets, most of which are attended by a person who will charge about RUB15 for entry. It is a good idea to take your own toilet paper, as it is not always provided. The toilets are typically extremely dirty by Western standards. If you are a Westerner, you can get away with wandering into the Western hotels, which have lovely bathrooms— the Grand Hotel Europe in particular. Just don't ever push your luck with suit-clad men guarding the hotel entrances, they are tough as nails if provoked. Many restaurants also allow tourists to use the toilet without being a customer. There is a local weekly English-language newspaper, The St. Petersburg Times. Saint Petersburg is plagued by mosquitoes during the summer, as the swampy surroundings of the city give the mosquitoes excellent living conditions. In budget accommodation with few countermeasures against the mosquitoes, this can be a problem at night, putting your well deserved sleep at risk. To avoid this, you can buy a fumigation kit (Raptor, Mosquitall, etc.) available in any supermarket. Day trips can be done on your own or via an organized excursion offered by many tour operators. Even though it is a lot to see in one day, Peterhof, Kronshtadt, and Lomonosov are all located in the same general direction west of Saint Petersburg and are all accessible by hydrofoil, so it is popular to see all three sites in one day. Gatchina — Big palace and park located in a beautiful village 50km south of Saint Petersburg. Kronshtadt — Old seaport town on Kotlin island, 20km directly north of Lomonosov. Main Russian naval base from early 18th century. You may take a hydrofoil back to the Hermitage for RUB 400 one-way. Lomonosov (AKA Oranienbaum) — Park with museum honoring Michael Lomonosov. 9km west of Peterhof via the A121 highway. Train station name is Oranienbaum ('Orange tree' in German). TIP - You may also visit Kronshtadt and take a hydrofoil back to the Hermitage for RUB 400 one-way, an inexpensive alternative to the more expensive ones leaving from Peterhof. Oreshek Fortess — a medieval russian fortess at Orekhovy Island in the mouth of Neva, 50km east of Saint Petersburg. Pavlovsk — Lusicous green park where you could feed the squirrels from your hands. Can be reached by train from Vitebskiy station (not the main hall, but the smaller hall for local trains, which is on the right side as you face the station). Pavlovsk train station is close to the northwestern gate to the park, and from there it is a long (but pleasant) walk though the park to the palace. Pavlovsk is a former residence of Emperor Paul I . The elegant classical style palace looks much different from bright and colorful baroque. The estate is famous for its huge picturesque English garden. 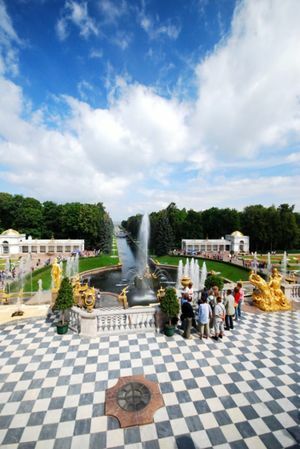 Peterhof — Home of the sumptuous "Russian Versailles" and the recently open to visits "Petrodvorets Watch Factory - Raketa", 30km southwest of Saint Petersburg. Petergof Lower Park — The palace ensemble is often referred as the "Russian Versailles’. You’ll enjoy a picturesque walk through the gardens with three unique cascades and dozens of powerful water jets and admire Grand Cascade, with its staircases, waterfalls, an avenue of 64 fountains and 37 gilded statues. During the tour will walk past elegant royal pavilions. Pushkin (A.K.A. Tsarskoye Selo) — 25km south of Saint Petersburg, with beautiful parks and palaces, most notably the Catherine Palace built for Tsarina Catherine I. The Catherine Palace is probably the most luxurious summer palace near St Petersburg. It is located in the town of Tsarskoye Selo 30 km south of St. Petersburg, Russia. During the tour you’ll walk through a magnificent gallery of gala rooms and discover the legendary Amber room. Repino — House-museum of the artist Ilya Repin, located just off the Gulf of Finland, where he lived and worked. To get there: Elektrichka train from the Finlandsky Station (45 minutes, round trip fare RUB 120, eleventh stop on the westbound line — check in advance to make sure the train you board stops in Repino — then from the station cross the main road and walk down the path to the left of the supermarket through a resort complex to the next major road. Turn left and walk about 1.5km to the gate marked Penaty. The walk takes about 45 minutes. The museum and grounds close at 3PM, or earlier if there are no visitors. Staraya Ladoga — the first capital of Russia is a pleasant little village four hours away with an incredible wealth of historical sights, including its own stone kremlin and church frescoes by the hand of none other than Andrei Rublev. Vyborg, — town situated on the Karelian Isthmus near the head of the Bay of Vyborg, 130km to the northwest of St. Petersburg, 38 km south from Russia's border with Finland, where the Saimaa Canal enters the Gulf of Finland. Swedish built castle, started in the 13th century and extensively reconstructed by Russians in 1891–1894. Mon Repos, one of the most spacious English parks in Eastern Europe, laid out in the 19 century. Fortifications of the Mannerheim Line (built by Finland against the Soviet Union) are close by. Check the schedule of the 75 minute rapid train online. If you leave Russia and plan to return, make sure you have a multiple entry visa. Novgorod — Ancient town with churches and museums, 180 km from St. Petersburg. "Lastochka" high speed trains are the best way to get there and back. Narva, Estonia — 160km southwest of Saint Petersburg. 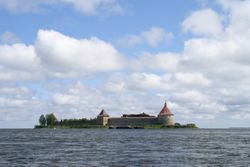 Located on the Narva river, which serves as the border between Russia and Estonia. Twin castles (Russian, established Grand Duke Ivan III, and Danish/Swedish). This page was last edited on 28 January 2019, at 23:17.